Nothing makes a holiday gathering more special than a truly memorable drink. Think about it -- we're all focused on the sweets we serve at and bring to our parties, and there's definitely nothing wrong with a gorgeous cake or inventive cookie. But there's only so much dessert we can process at a single get together, and so many of these labors of love get a bit lost in the mix. Enter the decadent drink. 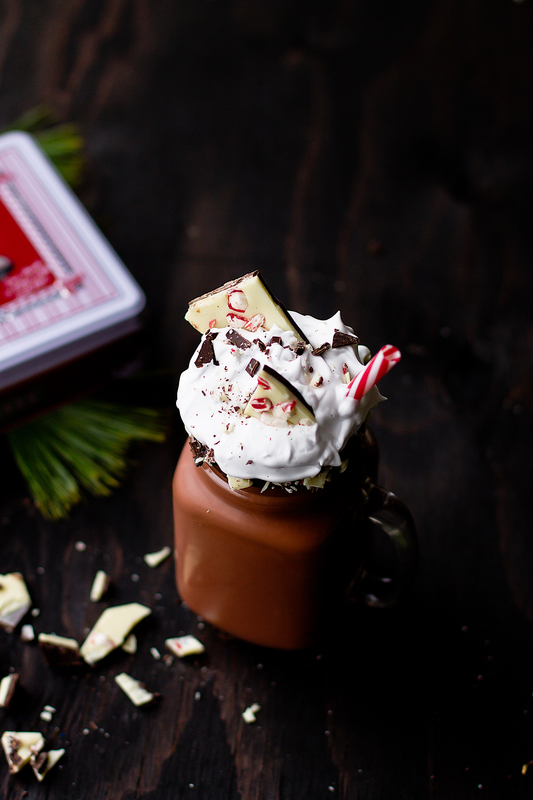 This Frozen Peppermint Hot Chocolate is Decadent with a capital 'D,' while still managing to be a bit grown up -- rich and chocolatey, but not too sweet, and less heavy than a milkshake. Plus, the addition of peppermint mocha liqueur puts this one firmly in the adult category. Presentation is so important this time of year, and a peppermint bark rim won't disappoint. They even travel well once they've cooled, so you can rim your glasses ahead of time and transport them to a party. A gorgeous drink that tastes just as good as it looks is a true holiday hero, so get your hands on some Williams-Sonoma peppermint bark and start mixing! Use a double boiler to melt the chopped chocolate and peppermint bark [If you don't have one, they're easy to make. Place a glass or metal bowl over a pot of simmering water, making sure the bottom of the bowl isn't touching the water -- the chocolate/bark go in the glass or metal bowl, and you can whisk to speed up the process.]. As soon as the chocolate/bark is completely melted, remove it from the heat. 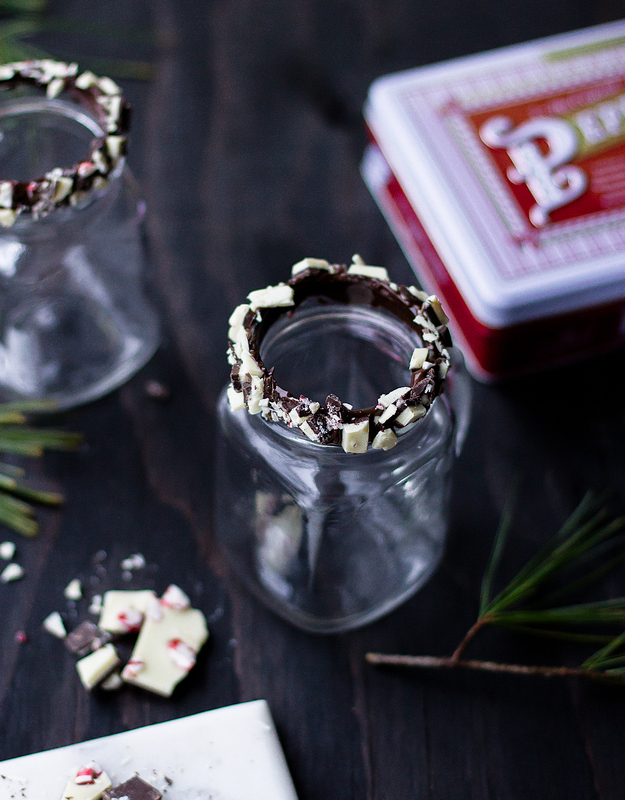 Dip the rim of each glass in the melted chocolate/bark, then press into additional roughly chopped peppermint bark bits. Whisk the cocoa powder into the remaining melted chocolate (if the chocolate firms up at any point, just put it back on the double boiler and whisk until it melts). Drizzle in the chilled liqueur very slowly, whisking the whole time. Add the chocolate-liqueur mixture to a blender with the ice. Blend until smooth, then pour into your peppermint-bark-rimmed glasses. 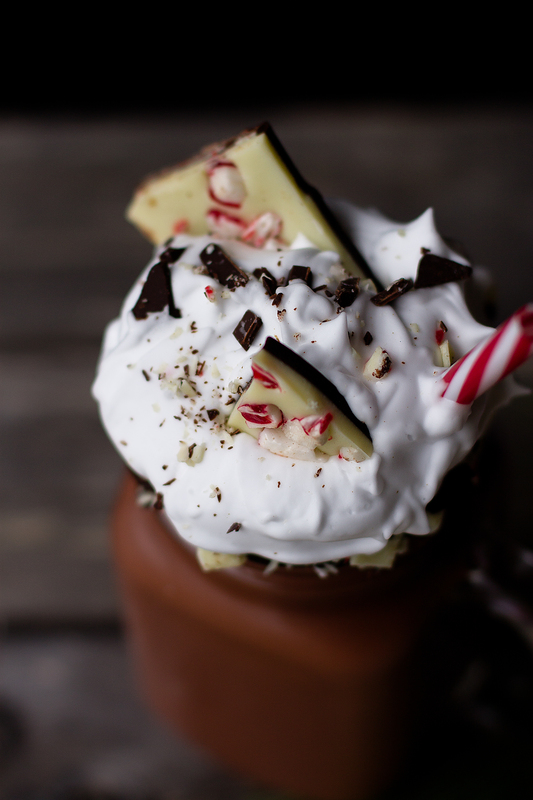 Top with whipped cream and additional peppermint bark pieces.